I always go wild whenever my favorite retailers offer their friends and family sales. Who doesn't love to save on both sale and full priced items alike? I'm excited to announce that Shopbop.com is offering a friends and family promotion this week. From Tuesday 10/13 to Thursday 10/15 you can save an extra 25% on most items on their website with the code INTHEFAM25. It's a great way to update your wardrobe for fall or splurge on that one special item you've been on the fence about. I'm already plotting which items I'm going to buy from the sale because many of my favorite designers are featured on Shopbop's website, including Clare V. who makes some of the most adorable clutches and bags you'll ever see right here in my hometown of Los Angeles. 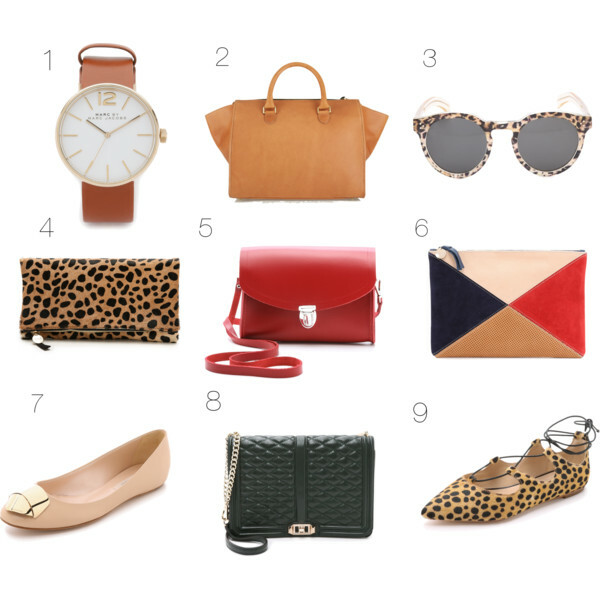 This Clare V. leopard clutch is in regular rotation in my wardrobe and, I think, a wonderful staple for anyone who wants to add just a touch of leopard to their wardrobe. Since this clutch is already in my closet, my only dilemma is to figure out which clutch I am going to add to my collection next! Below you will see some of my other picks from Shopbop's friends and family sale. As I said before, the sale offers a great way to stock up on some classic pieces for fall like my leopard clutch. What a lovely outfit! The skirt is gorgeous and looks amazing with the red top and shirt underneath. Such nice details too with the pearl necklace and leopard print clutch! I have never shopped at Shopbop but you have convinced me. I want one or two of those Clare V clutches badly. They are gorgeous. Yours is so versatile. I will take one of each of your picks. 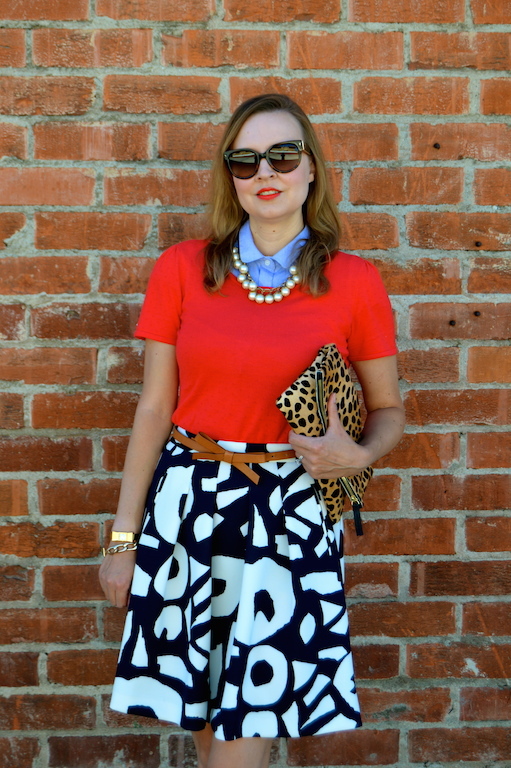 And I own a skirt almost in an identical print and style in black+white like yours. Love how you styled it on top. Hi Katie, I like everything about this outfit...it just looks smart and well styled. I guess my favorite part has to be the pearls against the blue color...fabulous! I just popped over from THT linkup. I love your clutch Katie, one of my fav designers of clutches, Also love the layering of the button down with the red, Looks great with the black and white print!! Gorgeous clutch and skirt, these were definitely made for each other.